Václav Klaus is a hot favourite in Friday’s presidential election. Backed by the ruling Civic Democrats in both houses of Parliament, he will only need 20 votes from other parties’ electors to win a second term in office. But his apparent advantage over challenger Jan Švejnar – experience in politics, originality of thought, and unwavering support for what he refers to as ‘Czech national interests’ – might also prove to be his greatest weakness. Václav Klaus in 2003, photo: CTK When Václav Klaus was elected in February 2003 the second president of the Czech Republic, and the tenth president of the country since 1918, his election victory came as a great surprise. Having lost two parliamentary elections in a row as Civic Democratic leader, it was expected that he would be beaten in this election as well and eventually retire from politics. But it was his opponent in the race, the former head of the Social Democrats Miloš Zeman, who suffered defeat instead and left Prague Castle through the back door. For Václav Klaus, a new stage of his career had just begun. Václav Klaus’ biggest strength in this contest is his experience in politics. Having served as President for the last five years, as Prime Minister for two 4-year terms and having been the leader of the strongest right-wing party in the country for more than a decade, no other current Czech politician can touch him in this respect. The rise of Václav Klaus to power began very soon after the Velvet Revolution in November 1989. As one of a handful of respected economists within the Civic Forum – an umbrella organisation which took over power from the communists – Václav Klaus became Czechoslovakia’s federal finance minister. In 1991, he founded the Civic Democratic Party which, under his leadership, became the country’s strongest right-wing party and the driving force behind the country’s economic transformation. 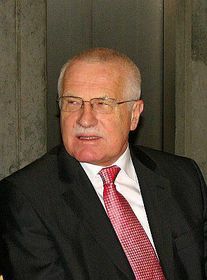 Following his party’s victory in the 1992 general elections, Václav Klaus became the prime minister of the Czech Republic within the federation. As an advocate of the free market, he focused mainly on the economic aspects of the transformation process; his critics point out that he critically neglected the significance of a strong legal framework. He was also the author of the voucher privatisation scheme as a means of transforming large state-owned industrial companies into private enterprises. 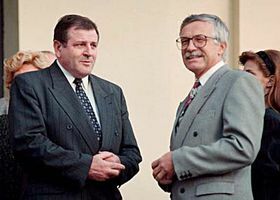 Václav Klaus (right) with Vladimír Mečiar in 1992, photo: CTK Václav Klaus also played a crucial role in the split of Czechoslovakia in 1993. His negotiations with his Slovak counterpart Vladimír Mečiar were instrumental in bringing about the Velvet Divorce, a term often applied to the smooth division of Czechoslovakia. The complicated relationship between Václav Klaus and President Václav Havel throughout the 1990s was a source of constant tension between the followers of the Civic Democratic leader and the president, who described Klaus’s economic policy as ‘gangster capitalism’. Despite heavy criticism of the Czech transformation in later years, Václav Klaus maintains that the Czech Republic did better than any of its peers in the region. 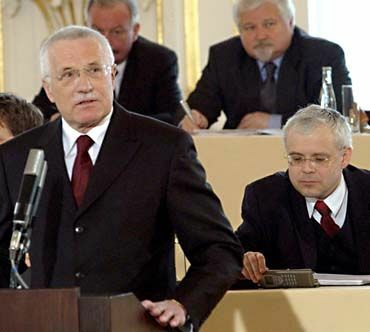 In 1997 Václav Klaus was forced to step down as the Prime Minister due to a financing scandal in his party. After an early election in the following year, he surprised his adversaries by striking the notorious ‘opposition agreement’ with the Social Democrats. This unusual agreement between the ruling and opposition parties, much criticized by other politicians including President Václav Havel, allowed the Social Democrats to remain in power. Václav Klaus resigned as the leader of the Civic Democrats in 2002, following yet another election defeat. He was elected the party’s honorary chairman and it was generally assumed that his days in politics were slowly coming to an end. But then came Václav Klaus’ victory in the presidential ballot, and Mr Klaus was back with a vengeance. Václav Klaus, photo: Štěpánka Budková Since becoming head of state in 2003, Václav Klaus has been one of the most significant figures in Czech politics. Succeeding the internationally renowned Václav Havel in the post, Václav Klaus spared no effort during his presidential term to defend his strong views on a wide range of issues ranging from the European Union and the role of civil society to the communist legacy and global warming. During his presidential term, Václav Klaus has increasingly voiced his distinct opinions, often anticipating popular demand which earned him accusations of being a populist. 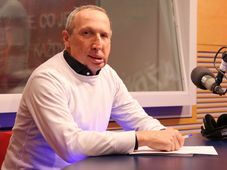 He refused to give a clear stance on the accession of the Czech Republic to the European Union and in 2003, he would not reveal whether he voted for or against it. 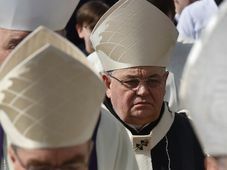 He has often criticized the European Union for a ‘democratic deficit’ and expressed fears of the Czech Republic losing some of its sovereignty. Václav Klaus also changed the course of Czech foreign policy set by his predecessor Václav Havel towards countries with human rights issues, most notably China and Russia. Václav Klaus has visited both of these countries, and was awarded the Pushkin Medal by his Russian colleague Vladimir Putin for his ‘contribution to the promotion of the Russian language and culture’. Another controversial issue which Václav Klaus has covered at length is the role of NGOs and other voluntary organisations in the society. He argued that they claim political power they never received in elections, and said they represent a ‘threat to democracy’. In recent years, Václav Klaus has become a vocal opponent of the global warming theory, claiming that the rise in global temperature is very small, and that it is impossible to establish whether or not human activity is to blame for it. Last November, Václav Klaus appeared in BBC’s HARDtalk talk show dedicated to this issue. As president, Václav Klaus has constantly topped popularity polls, as the country’s most trusted politician. While remaining a politician with strong right-wing focus, his defence of ‘authentic national interests’ made him popular with the electorate of the Social Democrats and Communists. On Friday, 281 senators and MPs will have to choose whether they prefer the experience and predictability of Václav Klaus, or the fresh, pro-European approach advocated by Jan Švejnar.